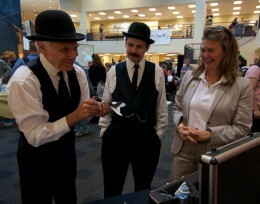 Amanda Wright Lane (pictured right at Wright State's Wright Brothers Day celebration) will deliver the symposium's keynote address by video. Amanda Wright Lane, whose great granduncles, the Wright brothers, are among Dayton’s most famous historical figures, will headline Wright State University’s Public History Graduate Symposium on Friday, March 2. Lane will appear by video to give the symposium’s keynote address. The event gives community members from around the Dayton area an opportunity to explore the region’s fascinating past. Wright State offers a master’s degree in public history with optional certifications in museum studies or archival administration and records management. Students in the public history program complete research projects and internships with a wide variety of local and regional archives, museums and historical organizations. Their presentations and poster sessions at the symposium will highlight all that they have accomplished and learned during their graduate study. “I’m looking forward to sharing my experiences and my knowledge of oral history, a social practice that can serve as a method for community activism,” said student Elise Kelly. Her presentation will highlight five local community activists who strive to improve the lives of area Latinos. Lane, Orville and Wilbur Wright’s great grandniece, will speak about her role as spokesperson for the Wright legacy and the importance of history and heritage in community development. “Amanda can inspire students to continue to use our heritage to educate, instill pride in our region and connect people personally to the past in order to make better decisions for the future,” Dewey said. The symposium will be held from 9 a.m. to 4 p.m. in the Student Union Pathfinder Lounge on Wright State’s Dayton campus. The event is free and open to the public. Registration will begin at 8:30. Attendees should make their own lunch arrangements. For more information, contact Dawne Dewey at (937) 775-2011 or dawne.dewey@wright.edu.